Holds files, reports, books, office supplies, samples, etc. Single compartment bag is offered in two practical sizes with extra depth for greater capacities. Zipper closure keeps contents intact. Tapered handles provide carrying comfort. I.D. window and address card included for routing bag. Silk screen imprint included (one color/one side). Please allow 3-5 weeks for delivery. Need it faster? 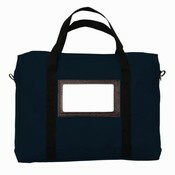 Click here - Stock Briefcase Bags ship in 24 hours!